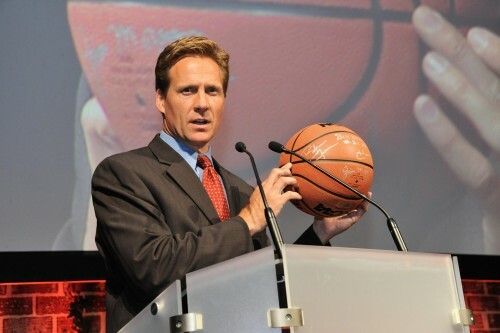 Over the years the Bearcats have earned much recognition for being among the nation’s elite in college basketball. 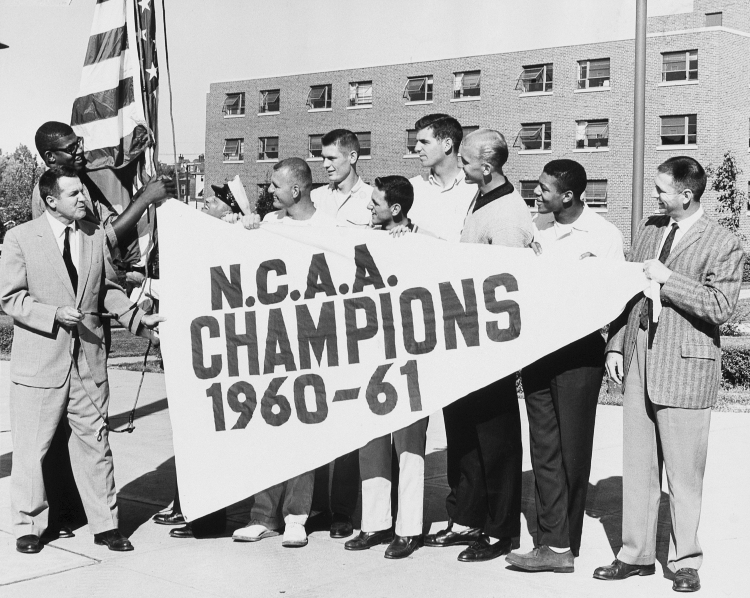 Under a rookie head coach and without the famed Oscar Robertson, the undeterred Bearcats delved into the 1960-61 season determined to dominate the court. And a success it was. 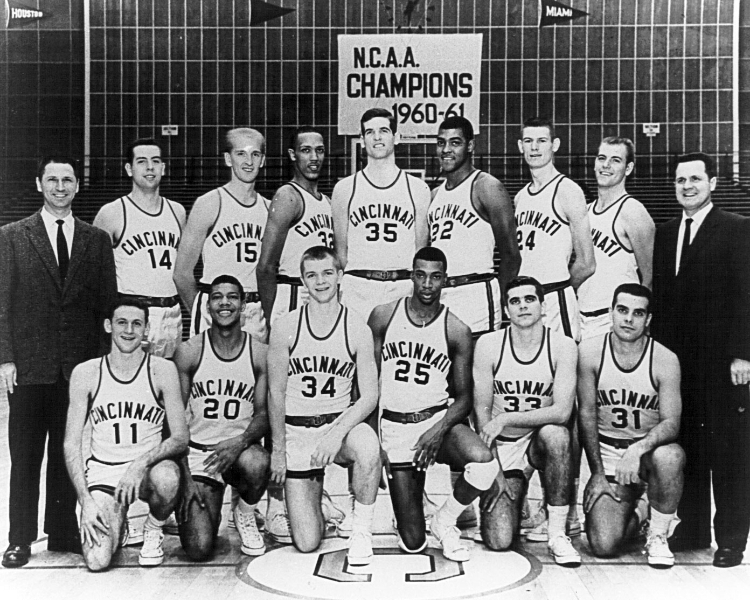 University of Cincinnati proudly claimed its first national title in 1960-61. 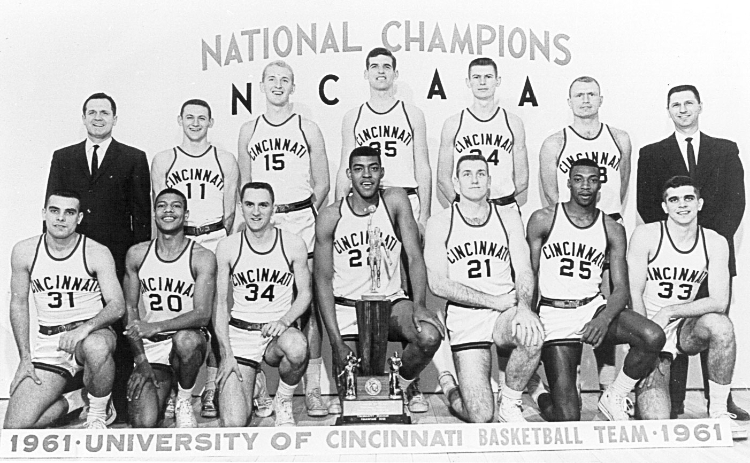 As though to show this win was no fluke, the Bearcats captured the championship once again in 1961-62. 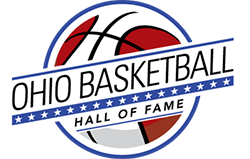 Cincinnati made a then unprecedented fifth straight trip to the Final Four in 1962-63, and narrowly missed capturing a third-straight national crown when Loyola ( Ill.) overcame a 15-point deficit and defeated the Bearcats by a basket, 60-58, in overtime. During those five seasons, the Bearcats recorded a 37-game win streak and posted a 161-16 ledger. The five straight Final Four appearances is a feat topped only by UCLA. 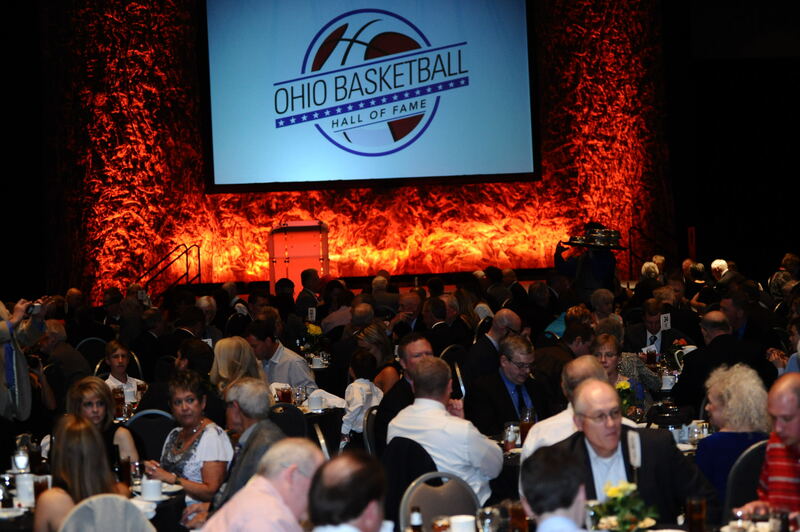 Front Row -- Jim Calhoun, Tony Yates, Carl Bouldin, Paul Hogue, Bob Wiesenhahn, Tom Thacker, Tom Sizer. Back Row -- Head coach Ed Jucker, Larry Shingleton, Fred Dierking, Ron Ries, Dale Heidotting, Mark Altenau, assistant coach Tay Baker. 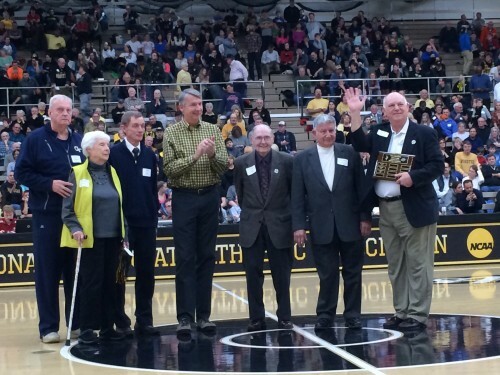 Front Row -- Larry Shingleton, Tony Yates, Larry Elsasser, Tom Thacker, Tom Sizer, Jim Calhoun. Back Row -- Assistant coach Tay Baker, Bill Abernathy, Fred Dierking, George Wilson, Ron Reis, Paul Hogue, Dale Heidotting, Ron Bonham, Head coach Ed Jucker.